The sole U.S. aircraft carrier builder is planning on laying off 1,500 employees over the next year-and-a-half as part of a series of cost saving measures, according to a letter sent to employees from the president of Newport News Shipbuilding this week. “These reductions are a result of a decrease in our workload over the next two years. While these changes are difficult, they are a necessary step we must take to preserve jobs to the maximum extent possible,” wrote Matt Mulerin in the July 20 letter obtained by USNI News. According to a “frequently asked questions” addendum attached to the letter, up to 500 hourly and salaried employees will be laid off in the fall, while an additional 1,000 layoffs “will occur as workload drops across the yard,” read the addendum. In addition to the layoffs, about seven percent of the yard’s 23,000 employees, other cost-savings measures include restricting raises, reducing holidays and limiting education reimbursement programs. Representatives with Newport News Shipbuilding and parent company Huntington Ingalls Industries did not provide additional details beyond the letter and the addendum, when contacted Friday by USNI News. 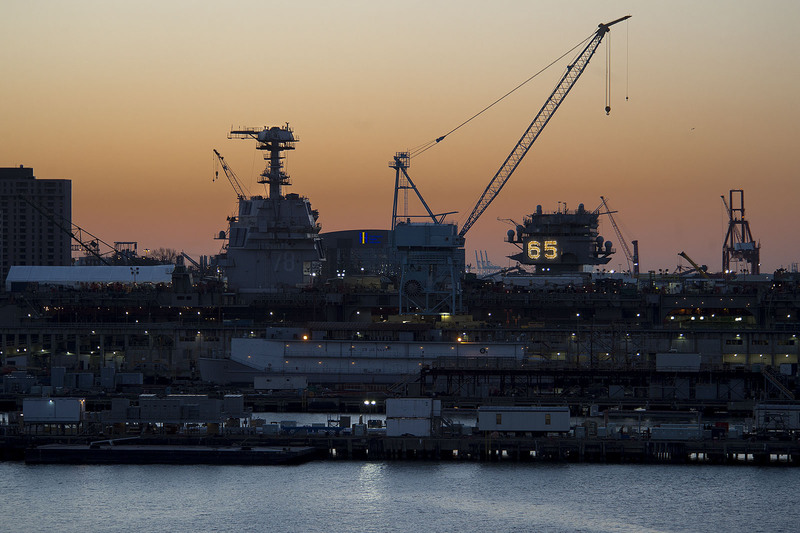 The yard’s business is largely divided into thirds: new carrier construction, Virginia-class submarine construction and the mid-life refueling and upgrades of Nimitz-class nuclear carriers (CVN-68). Over the time period of the layoffs, Newport News will complete three major carrier projects — completion of Gerald Ford (CVN-78), the refueling and complex overhaul (RCOH) of USS Abraham Lincoln (CVN-72) and the removing the nuclear fuel and decommissioning the former USS Enterprise (CVN-65). Meanwhile, of money from anticipated work from the Navy has not yet materialized, specifically the $4 billion RCOH of USS George Washington (CVN-73). The fate of Washington was a major point of contention between Congress and the Pentagon when then Secretary of Defense Chuck Hagel said the refueling would be a victim of the sequestration cuts from the 2011 Budget Control Act (BCA). After more than a year of back and forth over the issue, the RCOH for the ship will most likely come through. Still the contract for the work has yet to be issued and is nine-months later than originally anticipated while Congress, Pentagon and the Navy have debated whether to refuel or decommission the carrier, USNI News understands. Newport News’ vice president for Navy programs, Ken Mahler, warned in 2014 delay in the contract could result not only in setback the delivery of Washington but also cause a reduction in workforce at Newport News.